With your roof replacement project, filing an insurance claim may be one more burden to add to your growing “to-do” list. At New View Roofing, we strive to create a hassle-free process for you by providing insurance claim assistance. We service over 1,000 residential roofs annually and have extensive experience helping homeowners and business owners with the insurance claims process. New View Roofing works with every insurance company. Protecting your home is our utmost priority and as leading storm damage roof repair contractors in Dallas, we are experienced working with insurance adjusters. 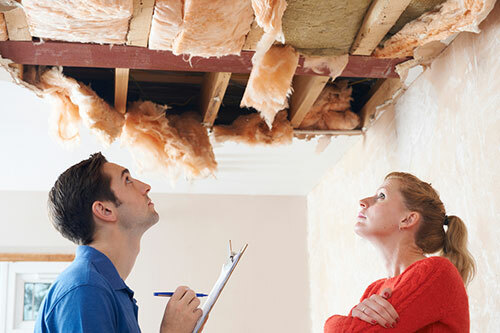 Roof Inspection — A qualified New View Roofing inspector will inspect your roof for storm damage and provide you with a free roof estimate on any necessary repair work. File a Claim — We’ll help you contact your insurance company to report a new claim. Adjuster Meeting — Once your insurance company sends an adjuster to your property to assess the damage, one of our team members will be there to ensure you are properly represented. Review Paperwork & Sign Agreement — You’ll receive insurance paperwork outlining all of the details of the claim. Our project manager will review the items to ensure everything is correct, then we’ll provide an agreement of the work to be completed. Claim Revision — New View Roofing will review the Insurance Statement of Loss and send additional invoices to the insurance company for reimbursement of repairs throughout the duration of the project. Roof Installation —We’ll schedule your new roof installation and complete all work on the property loss worksheet for the eligible amount your insurance company permits. Rest assured that New View Roofing has you covered when it comes to storm damage roof repair in Dallas, along with insurance claim filing assistance. To schedule a consultation and get a free roof estimate, call us at (469) 232-7220 or fill out our contact form.